The torque effect derives from Newton’s third law: for every action, there is equal opposite reaction. If the engine acts with force on the propeller, the propeller will react with equivalent force. If the prop rotates to the left (5), the torque effect will rotate the paramotor to the right (6). The whole paramotor will yaw to the right, mostly with the pilot as well. One side of the paralgider is more loaded and pulled down (9). The paraglider will have the tendency to turn and is not capable of straight flight without pilot input. This effect is surprisingly strong and without proper compensation the paraglider would be poorly controllable. What determines the torque effect? Common knowledge is that torque effect is determined by the weight of the propeller. Most pilots think that buying a light propeller will reduce torque effect. The truth is, this is only partially true. Well, to be honest, hardly at all. Whilst flying, the weight of the propeller has absolutely no impact on torque effect. According to Newton’s first law, the propeller remains in continuous rotation unless another force acts on it. This force is the drag. But the drag is no way dependent on propeller weight. If the propeller rotated in vacuum, there would be absolutely no energy (action) needed to keep it in rotation. Hence, there would be no reaction = no torque effect. part of the engine output is consumed to overcome propeller drag. The drag acts against the direction of rotation and causes the whole paramotor to rotate. A thicker profile will generally have higher drag and therefore stronger torque effect. Wooden propellers are thicker to be strong enough, compared to carbon propellers. Wooden propellers generally have stronger torque effect and pilots often think it is because of its weight. The reason is the thickness of the profile. The same propeller will have higher torque effect at higher RPM, because drag increases by the square of speed. A larger propeller will have lower torque effect than a smaller one at the same flight regimes. A large propeller is more efficient and to achieve the same thrust it requires lower pitch or lower RPM. A large propeller will have lower drag and lower torque effect. This is why we have chosen a 51 inch (132 cm) propeller for the SCOUT. This effect is present all the time the propeller is turning. In further reading, I refer to this effect as Continuous Torque. Why is torque effect bad for powered paragliding? You can live with it, but it makes the flight less comfortable. You feel it during full-power take-off. The paraglider just flies into a turn and the pilot has to steer to fly straight. You feel the torque effect the most in sharp turns while the pilot uses full power to make the turn sharper. The glider turns to one side perfectly because the torque effect does the weight-shift, but hesitates to turn tightly to the other side. How do paramotor designers fight the torque? You cannot eliminate the torque effect. This is physics and you cannot cheat. You can only compensate. Paramotor designers usually use two ways to compensate. Both have the same principle: the torque effect loads more to one side, so designers put more weight, of the pilot and/or paramotor to the other. The diagonal strap is mostly used with high hook-in harnesses. The strap leads from the edge of the harness under pilot’s knee diagonally to the paraglider carabiner. A portion of the weight of pilot’s leg is transferred to the other side. The advantage is that the length of the strap is adjustable. So if pilots flies on fast trim and speed bar, he will need more throttle and thus experience higher torque. The pilot will shorten the diagonal strap and more weight is shifted to the other side. It works well and it is not uncomfortable. It may limit pilot’s ability or comfort to run during take-off and many pilots choose to engage the strap only aftee take-off. The torque is not compensated during take-off in this case. This method is used mainly for paramotor with weight-shift swivel arms as the diagonal strap would block the arms movement. The center of weight is not exactly in the middle of the glider hang-points Actually, the whole paramotor and pilot are moved a little to side so that one glider hang-point is loaded more than the other. During flight the whole weight becomes balanced: (1) the torque put more load on one side and (2) the asymmetric center of weight put more load to the other side. As a result, the glider flies straight, if done properly. The moment the pilots adds full power, the torque becomes much stronger, but the carabiner offset remains the same. The glider will turn. This is why we consider these methods of compensation to be static, i.g. they work properly only at certain level of prop RPM. Still, how does propeller weight affect torque? Weight of the propeller does have effect on torque but only during propeller acceleration. Same third Newton’s law is applied but the reason is different. To accelerate the propeller, i.e. to rev it up from level flight (aprox. 1400 prop RPM) to maximum (aprox. 2800 RPM) , it is necessary to add a lot of energy for rotational mass acceleration (see Jeff Goins’ article on Paramotor Torque). The heavier the propeller is, the more power is needed for its acceleration, therefore more torque is present. I would call this effect Acceleration Torque. However, this will pass away very quickly as it takes just a second to reach max RPM. As desired propeller RPM is reached, no more energy is is needed to accelerate and this effect will be replaced by Continuous Torque described in earlier chapter. From this moment on, the torque will not be affected by the prop weight. The symptoms are equal (the glider turns to one side), only the cause is different. 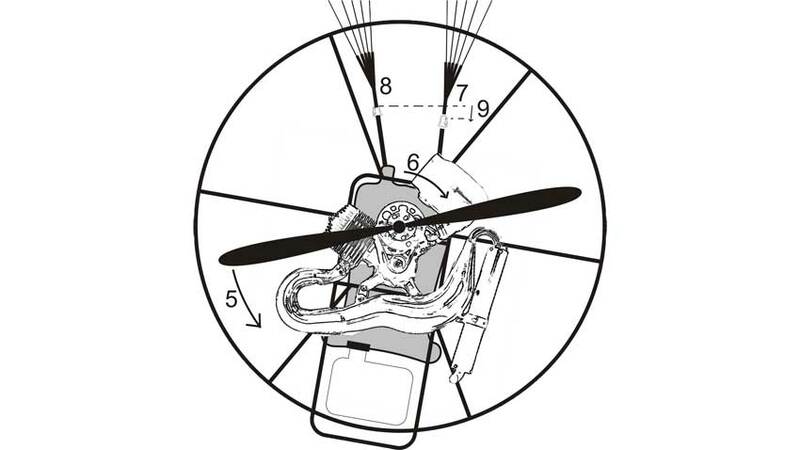 The pilot will not distinguish between these two effects on a regular paramotor. There is no way to eliminate this effect. Using a lighter propeller would reduce it, but this is no solution for avery case. We have experienced bad performance of extremely light propellers on paramotors with geared reductor. Because of lack of momentum, the gears will rattle and vibrations increase. How did the SCOUT solve the torque issue? SCOUT does not use any of the earlier described methods for torque compensation. We do not have any diagonal strap and the hangpoints ar perfectly centerred. Our solution comes down to the very root of the problem: torque is an aerodynamic effect as it is caused by aerodynamic drag of the propeller. We decided to compensate it the same way, i.e. aerodynamically. SCOUT’s cage is made of carefully designed asymmetric airfoil profiles that create lift when air flows around them. The combined lift of all these profiles generate rotational force (torque) in the opposite direction to the propeller torque effect. Although the flight speed is defined by the paraglider and is basically constant during flight, the airflow generated by the prop is significant. As the propeller rotates faster and torque effect increases, so does the airflow through the cage and the compensation force increases. Dynamic Torque Compensation is a patented technology by SCOUT. Check this video of a paramotor crash: according to description by the author, this accident was caused by torque effect. Well, author’s statement is completely wrong. This is just a completely different effect and we will explain it next time.